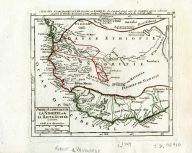 Title: Partie Occidentale De La Nigritie et de La Haute Guinee. Notes: Poppen; later edition, From Atlas Portatif Universel, by Robert de Vaugondy. 78, Pag.566 outside border top right. Mary Sponberg Pedley does not mention a state without date.